Distinguished civil engineer, Marvin Runyan, passed away Monday, April 28, 2014, at home. He was the retired president and ceo of Stevens, Thompson and Runyan (STR), a Portland consulting engineering firm responsible for designing hundreds of water and waste-water treatment plants to provide clean rivers and safe drinking water in the Pacific Northwest and Alaska. Projects included design and construction supervision of Bull Run Dam No. 2 and the familiar Oregon City Municipal Passenger Elevator. Marv was born in Willamette, attended Molalla Union High School and graduated in 1941 with a B.S. in Civil Engineering from Oregon State College. During World War II, he served in the U.S. Army as an officer with the 110th Combat Engineer Battalion in the Aleutians and South Pacific - Adak, Kiska, Oahu, Eniwetok, Leyte and Okinawa. His civil engineering career began in 1940 on a survey crew working for Stevens & Koon on the Umatilla Ordnance Project near Hermiston. He returned to the firm after the war, advancing to associate (1952), partner (1955), executive vice president (1961), president and ceo of Stevens, Thompson & Runyan, (1976) then engaged in civil engineering projects nationwide. 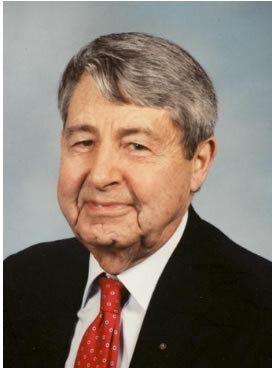 Marv received numerous professional awards throughout his career and was an active member and officer of many professional organizations including American Society of Civil Engineers, Consulting Engineers Council USA, National Society of Professional Engineers, Engineers and Architects Council of Oregon, Water Pollution Control Federation, American Waterworks Association, American Academy of Environmental Engineers and American Public Works Association. He was honored to serve as national chairman of ASCE's New Code of Ethics Committee, a five-year effort in cooperation with other engineering societies to develop a standard code of ethics for the engineering profession adopted in 1976. He also highly valued his membership for over 40 years in the Portland Downtown Rotary Club. Following retirement, Marv filled his life with travel, photography and visits to his beach house. In 1996, he and his wife of 58 years, Julia, moved to Willamette View where they participated in the center's many activities. Julia passed away in 2000. Marv is survived by his son, Steven (Jan); daughter, Nancy (Randy); three grandchildren; and seven great-grandchildren. A memorial will be held at 2 p.m. Saturday, May 10, 2014, at Hillside Chapel, 1306 Seventh St., Oregon City. Reprinted from the obituary published in The Oregonian from May 2 to May 4, 2014.